There was another good sale of 733 Sheep on Tuesday at Saintfield with Hoggets selling to a top of price of £105.50 and a top of £4.53 per kg. Fat Ewes selling to a top price of £100. Breeding sheep selling to a top of £130 for a pen of seven Springing Ewes. 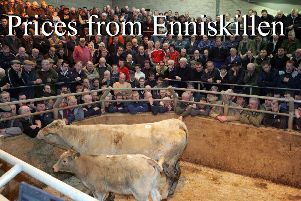 HOGGETS: Carryduff producer, 51 27.5kgs £105.50, Ardglass producer, 21 26.5kgs £104.50, Downpatrick producer, 26 30 30kgs £103, Downpatrick producer, 16 27.5kgs £102, Killinchy producer, 39 27kgs £102, Dromara producer, 28 26.5kgs £102, 19 22kgs £95, 22 22,5kgs £95, 16 22.5kgs £93, Killyleagh producer, 17 26.5kgs £101, Ballynahinch producer, 28 24.5kgs £100, 21 23kgs £95, 8 19.5kgs £87, Castlewellan producer, 14 24.5kgs £98.50, Newtownards producer, 14 24.5kgs £98.50, Ballynahinch producer, 8 25.5kgs £98, 2 21kgs £89, Comber producer, 25 23kgs £98, Ballynahinch producer, 4 22.5kgs £93, Dromara producer, 3 24kgs £93, 9 17kgs £77, Killinchy producer, 17 21kgs £90.20, Saintfield producer, 8 21.5kgs £90, Kircubbin producer, 7 19.5kgs £88, Seaforde producer, 9 23.5kgs £88, Hillsborough producer, 6 18kgs £81, Killinchy producer, 2 17kgs £69. FAT EWES: Ballynahinch producer, £100, Killinchy producer, £90, £70, Downpatrick producer, £87, Comber producer, £75, Hillsborough producer, £69. BREEDING SHEEP: Springing Ewes - Comber producer, 7 at £130, 8 at £112, 6 at £110, 9 at £100, 16 at £80.